Who didn't love pixie sticks as a kid? A colorful tube full of colorful sugar. What wasn't to love. As a parent the idea of letting my kids eat them makes me cringe a little and I am far from a health freak. But I absolutely love the idea behind these homemade pixie sticks. That colorful powder is actually freeze dried fruit. They are just as colorful and just as fun, but with a lot less cringing from parents. 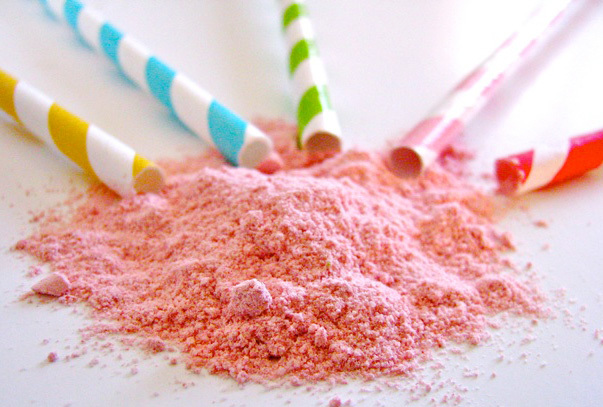 You can see all the details on how to make your own pixie sticks over at Shindig Parties To Go. Thank you, Lorie! Brittany will be so excited her great idea is being featured!